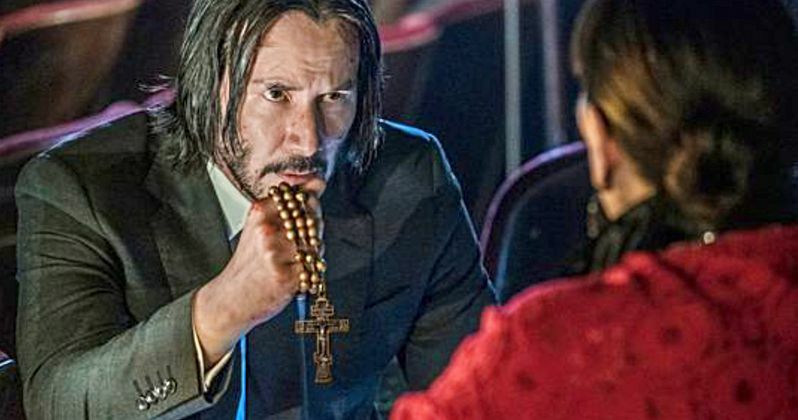 A brand new image from John Wick 3: Parabellum has made its way online. It's a new year and there are a ton of new movies to look forward to, many of which or new installments in ongoing franchises we've come to love. Such is the case with the latest chapter in the John Wick saga. Now, we have a brand new image that helps give an idea of just how desperate the famed assassin is going to be in his latest movie. The image sees Keanu Reeves' assassin clutching a rosary and looking worse for the ware. We see him holding this item up to a figure who has her back to us, but appears to be Anjelica Huston's new character, the Director, who we were introduced to in another image recently. Clearly, John is desperate for help since virtually every assassin in the world is coming after him, given the events of John Wick: Chapter 2. To go along with the new image, director Chad Stahelski had this to say about the upcoming sequel. "I'm a big fan of Joseph Campbell's mythologies of the hero and what he would have defined as the theater of pain, or sometimes we call it 'The Die Hard Conundrum': We just to like to beat the (stuffing) out of our heroes... If you choose that kind of lifestyle, you're going to be pretty beat up. So we like John Wick to suffer and think Keanu loves for John Wick to suffer, too." Since John violated the rules of The Continental at the end of the last movie, a very large price has been put on his head. In order to survive, he's going to have to stack up a lot of bodies and get a lot of help. On his journey, Wick is going to encounter a new character, as portrayed by Oscar-winner Halle Berry as well. The cast for this new chapter also includes Ian McShane, Ruby Rose, Common, Lance Reddick, Laurence Fishburne, Hiroyuki Sanada, Jason Mantzoukas, and Boban Marjanovic. Chad Stahelski co-directed the first John Wick alongside David Leitch, and then flew solo for the sequel. He's back again solo for this third outing which probably isn't going to be the last we've seen of Mr. Wick. Or, at the very least, this intriguing universe. Development is taking place on a series titled The Continental that will focus on other characters in the universe and, as the name implies, will center on the assassin's hotel. Chad Stahelski also recently expressed his desire to keep making these movies as long as people keep showing up to watch them. The trend has been upward at the box office so far. Let's hope that continues this time around. John Wick 3 is set to hit theaters on May 17. Be sure to check out the brand new image from USA Today below.